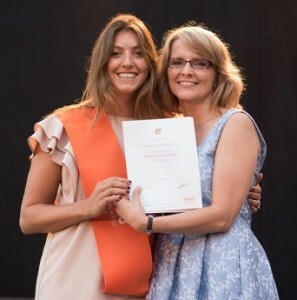 MBA graduate Isabella Steyer-Mader from Austria with programme director Ella Boniuk. Choosing the Path of Development (PoD) was an important decision for me, so I took my time evaluating the options. As I already had a background in digital marketing, I chose to do another Path of Development: Global Innovation Management. Having worked in the startup industry before, I had had the chance to witness how technology and disruptive innovation can change industries and even create whole new economies. The Global Innovation Management PoD was a bit of a challenge in the beginning without an engineering or programming background due to the highly technical environment. What I learned ﬁrst was that to be creative and to have an impact depends not only on a person’s technical background, but also on the openness to new ideas and the ability to transform them into something customers can value and utilise. The trip to Bangalore, India opened my eyes to the needs in other parts of the world as well as the highly innovative projects that companies and startups are working on all over the world. The market power in a market like India is more than powerful. Success is not based on non-proﬁt organisations, but rather competitive price and high quality products that meet necessities. The week in India made me realise how important it is for me personally to work and create for communities in need of products that fill basic needs here in Europe. The significance of the “give and take of price and quality” was a key learning point throughout the week in India. As I was going through my PoD, I had a choice to make about my future: go to São Paulo, Brazil, or stay in Europe with a secure job close to all of my friends and family. The trip to India helped me choose the new adventure, experience more and see how business is done far from my own culture and country. One of the most exciting weeks within the Global Innovation Management PoD was the challenge we were given to work for Telefónica; it brought a great deal of knowledge to our team. We had many ups and downs, but when we presented our project to Telefonica managers, we had the chance to show our work to an external client. We won best project for our pitch, making our team proud after working so hard. The choice that you make for your PoD is important, as it will determine the focus and specialised learning of the last month of your MBA. Global Innovation Management is a great choice for anybody who wants to experience new things and learn something different from ﬁnance or marketing. It was the right choice for my own professional development, and I will incorporate my new knowledge into my next job working with startups in São Paulo. The ﬁnal project is a lot of work and it gives you the chance to apply what you have learned during the different stages of the MBA, with feedback on your work almost immediately. We started forming our team early, even before an idea had fully evolved. The team is important, as I spent a lot of time with my team members. We had members from Colombia, Peru, Spain, Austria and Jordan. It was an amazing opportunity to work with people from so many countries on the project/business plan. I was very lucky and I could not have asked to be part of a better team. The best part of the ﬁnal project is the team and the chance to work on a real-life project. The ﬁnal project is carried out over nearly the whole MBA, and the feedback includes an evaluation of the feasibility of the project. We went through many stages, from identifying the original idea for the project to brainstorming and pivoting. When it came to the different areas of expertise, we started forming smaller groups. This gave us the opportunity to work in our specialised area with another group member. With the help of our tutor we were able to develop a solid idea and plan the actual business idea. The meetings with the tutor were a big help throughout the year to align our work and stay on track in the frame of the constantly evolving ideas. Together with the meetings, the interim presentations of the different topics made sure we stayed focused throughout the year. After the feedback from the interim presentations, we started working on the ﬁnal pitch. The last two weeks quite challenging, with constant meetings, writing the report, building a 15-minute PowerPoint and preparing for the 45-minute Q&A from the tribunal. The ﬁnal pitch was presented in front of the whole class and a tribunal of experts and investors in the EADEA-Residential Training Campus. The day of the ﬁnal pitch, we were excited, and of course, nervous. The teams had been working towards this moment almost the whole year. The final pitch is very important, as it demonstrates your (and your team’s) abilities to external business experts, as well as showing how hard you have been working throughout the year. It is really amazing to see the presentations of the classmates with whom you have been sharing a year of intense work and classes. The presentations made me realise the high quality of the professionals in our class. Writing the business plan for the final project made me realise how important it was to have a team to count on and to learn from daily. Our team consisted of culturally diverse members, which made the experience even more enriching. Getting to know the different cultures and personalities over the course of the project was as important as the business knowledge gained. The ﬁnal presentation also marked the end of the MBA experience. Now we are all ready to leave Barcelona and EADA, but the experience and the satisfaction of completing the MBA remains with us, as well as the friendships developed over the course of the year. Isabella Steyer-Mader is a graduate of the International MBA class of 2017. Isabella received the Sport Elite Scholarship and here she shares how the Global Innovation Management specialisation helped develop her professional plans post-graduation.